We welcome you to First (Scots) Presbyterian Church, a congregation of the Presbyterian Church (U.S.A.). We invite you to explore our website and learn more about the life and ministry of our church. Since 1731 this diverse, vital and growing congregation has served Jesus Christ and the world beyond our walls in Christ’s name. Worship, Education, Mission and Fellowship are the hallmarks of our ministry together and there are an abundance of opportunities for leadership and participation. Join us for worship or one of our many other activities during the week. Tours: We offer tours of our church every Sunday following worship service(s). Come to the front pulpit area after worship and our docent will lead you on a 15-20 minute tour. If you have a larger group and would like to schedule a tour during the week please call ahead (843-722-8882) and we can arrange a tour. 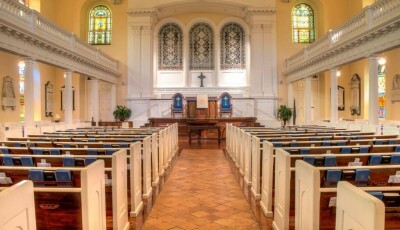 First (Scots) Presbyterian Church's Mission: Summoned by God's grace in Jesus Christ to be friends and servants of God and neighbor, and to make disciples of all nations, our mission is to glorify and enjoy God, honoring the past, serving the present, and shaping the future through shared ministries of worship, education, mission, and fellowship. Learn more about The Pillars of First (Scots) Presbyterian Church.